Harlaxton College has received a certificate of commendation from Andrew Lloyd Webber and Historic England’s Chief Executive Duncan Wilson in the ‘Best Rescue of an Historic Building or Place (under £5 million)’ category of Historic England’s Angel Awards 2018. Keep abreast of the latest Harlaxton news, and let us know your news too! We want you to be able to get the latest news from Harlaxton College. Whether it's news on exciting campus developments, events, or student and faculty successes, our news pages will allow you to keep up-to-date and interact with us. For information on hosting an event at the manor, visit the Harlaxton Manor website. A listing of all prior news releases and announcements in chronological order. 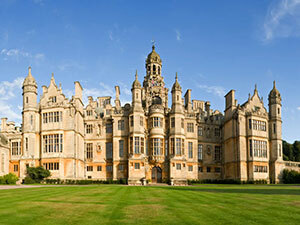 Check out what’s happening at Harlaxton College. Friday, April 19, 2019, 2:00 p.m.
Friday, April 19, 2019, 7:00 p.m.
Sunday, April 21, 2019, 9:00 a.m.
Sunday, April 21, 2019, 3:30 p.m.
Monday, April 22, 2019, 6:00 p.m.